Charles Edward Anderson "Chuck" Berry (18 October 1926 – 18 March 2017) was an American guitarist, singer and songwriter, and a pioneer of rock and roll music. Introducing "School Days" on The History of Rock and Roll, (1978), Hour 1: "The Birth of Rock & Roll"
"Maybellene" (1955); this song was also credited by the record company to other "co-composers", in what has been generally accepted as a form of "payola". "Brown Eyed Handsome Man" (1958), Pop Chronicles Show 5 - Hail, Hail, Rock 'n' Roll: The rock revolution gets underway. Part 1. Steve Martin's character, a psychic named Cocuwa, predicting that the cover of Time Magazine for the upcoming week will show these four words, which supposedly had been sent to Earth the week before from extraterrestrials, after they had listened to a Voyager Golden Record, in a Saturday Night Live segment ("Next Week in Review") in episode 64, during the show's third season. 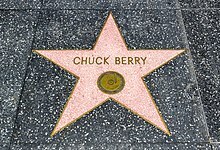 While no individual can be said to have invented rock and roll, Chuck Berry comes the closest of any single figure to being the one who put all the essential pieces together. This page was last edited on 26 August 2018, at 14:51.